We're looking for a mobile developer that loves making users smile, a content marketing pro to get Everyst stories to readers, and of course great interns to keep us in check and introduce new ideas to the mix! Before getting into the details of who we're looking for, let us tell you about where we want to go with Everyst! Reawaken imagination by telling stories that fit real-time. Reawaken the imagination. Reawaken dreams of going out in the world and climbing the mountains of life. By telling stories. Stories that are experienced by seeing the world through another's eyes. Stories that fit real-time. Stories that fit our real daily lives outside of the free-time when we can watch movies and read books, by telling stories in seconds long chapters on social. Give artists like the ones in our library new medium to create their story, and an app to grow their audience in. Helping them to explore new ways to get in touch with their readers, not with marketing, just with their story. 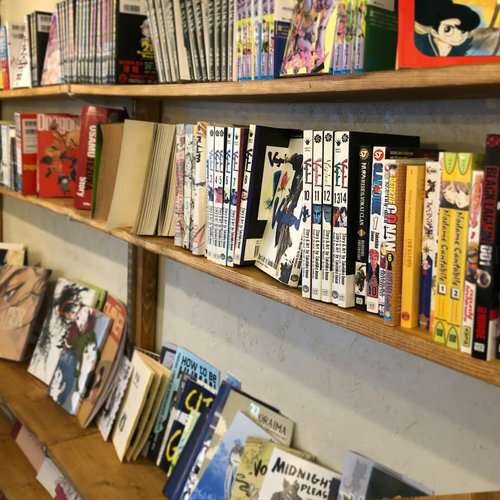 In Japan there's no stigma around reading manga, it's for all ages and everyone! We think that's great, cause stories like Space Brothers help keep dreams alive, and we want to do that worldwide with our new style of comics/manga! Facts and non-fiction aren't always the best educators. Sometimes you've got to spend time with someone or even walk in their shoes to feel for them. That's why we're donating stories and collaborations to NPO's. Binge watchers who go beyond watching and dream about the worlds their characters live in. Readers and audiobook listeners who are constantly plugged into a story. Gamers who don't just play to win, but play for what happens next. Creative people who love telling their own stories. The chance to make Everyst yours as an owner in the company with an options package. We're not an on call 24/7 kind of team. When you're on you're expected to be on, and when you're off, turn off Slack! Enjoy working in a story production team, and feel like you're working whenever you read a comic, manga, or story. We also offer full health care and all the general benefits, along with annual salary raises, and can help you maintain your Japanese visa if necessary. growth hacker, strategist, or whatever title you call yourself as long as you can show how your words translate to numbers. • Finding the right online communities for our stories. • Making sure authors have everything they need to promote their stories. • Managing advertising funnels and refining based on analytics. • Working with our design team to create new promo campaigns. • Letting us know what's missing on this list! • Some native mobile dev experience (Android/iOS). • Adding creative new onboarding to our reader app. • features to encourage conversation and inviting friends to our community. • Collaborating with our product team to ensure designs are usable and not too tough to implement. • Sharing what they think is important to add next. We're looking for marketing interns who have their own social media presence. Story production interns who are ready to tell a story to tell or collaborate with another creator through illustrations, photos, videos, or words. Development interns who are ready to learn about our process and consistently shipping code. Our internships last 3-months and require at least 20+ hr's p/wk. We hope you'll grow as part of our team and that after your internship we won't be able to resist offering you a contracting position or even stock options and a full-time paid position with our team! Send us a message below, along with any relevant links where we can learn more about you, and maybe a resume or portfolio. We'll look forward to you dropping by our office for a cup of cold brew coffee soon! We are happy to continue sponsoring your visa, but at this time are not recruiting those without an existing visa. any links you want to share, anything else you want to show off, or any questions!